So somehow I got lucky the other day. I randomly get this phone call from my neighbors who happen to have an extra ticket to the Dave Matthews Band concert and they need a date for their nephew. I was the lucky winner. Are you kidding me? Tickets to a huge concert?? I am totally down! We had tickets for the "Grooo Pit" which is like where the people stand right in front of the stage before the seats even start! It was super legit, and I must say....Dave ages quite nicely! He was very easy on the eyes! 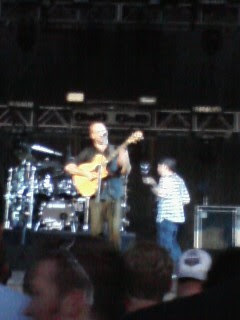 I didn't know like any of the songs cause I never listen to Dave Matthews, but it was still a way good time! Let me tell ya, that man can perform! It was so fun to watch him and I was so happy that I got hooked up with this free concert! This was the best pic I had on my phone, cause you couldn't take cameras!